A protester has died and there are reports of several injuries as demonstrators angry at rising fuel prices disrupt traffic across France. The female protester was struck after a driver panicked and drove towards demonstrators, reports said. Some 120,000 “yellow vests”, so-called after the high-visibility jackets they are required to carry in their cars, have gathered in 2,000 locations. They accuse President Emmanuel Macron of abandoning “the little people”. Mr Macron admitted this week that he had not “really managed to reconcile the French people with their leaders”. The female protester was killed in the south-eastern Savoy region when a driver who was taking her daughter to hospital panicked at being blocked by about 50 demonstrators, who were striking the roof of her vehicle, and drove into them, Le Parisien newspaper reported. The driver has been taken into police custody in a state of shock. Protesters in Brittany in north-western France held a minute’s silence for the victim. The protest “would be a failure” if it cost lives, Interior Minister Christophe Castaner was quoted by Le Parisien as saying. “We are very worried. It is important to avoid risks,” he said. Elsewhere in France there were reports of dozens of injuries, most taking place as infuriated drivers attempted to force their vehicles through crowds of protesters. In Arras in northern France a 71-year-old demonstrator suffered serious injuries after being struck by a car which then scattered more demonstrators as the driver sped off, la Voix du Nord newspaper reported. The driver was later arrested. In the northern town of Hazebrouck, two people were hurt when a truck driver mounted a pavement and forced the vehicle through protesters, la Voix du Nord reported. Two more people were hurt when a blocked driver turned round and collided with two oncoming vehicles near the eastern city of Besançon, L’Est Républicain reported. 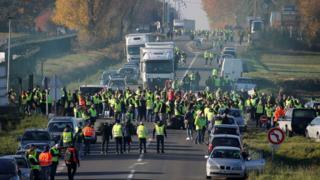 In Sélestat near Strasbourg a driver ran over a protester’s foot, the DNA regional news website reported. In the southern town of Grasse, a police officer was struck by a driver attempting to force his vehicle through a protest. The driver was arrested, Nice-Matin reported. Police have used tear gas to disperse protesters blocking a bridge in Savoy, reports said. Why are drivers on the warpath? Speaking on Wednesday, the president blamed world oil prices for three-quarters of the price rise. Mr Castaner argued that the fall in world oil prices would compensate for the tax increase. It has broad support. Nearly three-quarters of respondents to a poll by the Elabe institute backed the Yellow Vests and 70% wanted the government to reverse the fuel tax hikes. More than half of French people who voted for Mr Macron support the protests, Elabe’s Vincent Thibault, Elabe told AFP. The BBC’s Lucy Williamson in Paris says the movement has grown via social media into a broad and public criticism of Mr Macron’s economic policies. Some of the protesters have been chanting that Mr Macron should resign, our correspondent says. They have certainly tried to tap into it. Far-right leader Marine Le Pen, who was defeated by Mr Macron in the second round of the presidential election, has been encouraging the movement on Twitter. Laurent Wauquiez, leader of the centre-right Republicans, called on the Macron government to scrap the next planned increase in carbon tax on fossil fuels in January to offset rising vehicle fuel prices. Mr Castaner has described Saturday’s action as a “political protest with the Republicans behind it”. On the radical left of French politics, Jean-Luc Mélenchon predicted that Saturday would be “divorce day for the French people” and the Macron project. However, the movement has no single leader and is not organised by any trade union. Olivier Faure, leader of the left-wing Socialist Party said the movement had been “born outside political parties”. “People want politicians to listen to them and respond. Their demand is to have purchasing power and financial justice,” he said. On Wednesday, the government announced action to help poor families pay their energy and transport bills. Prime Minister Edouard Philippe announced that 5.6 million households would receive energy subsidies. Currently 3.6 million receive them. A state scrappage bonus on polluting vehicles would also be doubled for France’s poorest families, he said, and fuel tax credits would be brought in for people who depend on their cars for work. Meanwhile, as potentially the biggest protest of his presidency gathers steam, protesters mock him relentlessly as “Micron” or “Macaron” (Macaroon) or simply Manu, the short form of Emmanuel, for which he famously scolded a student for using.